Biggish job today. 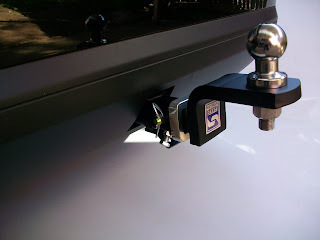 Hayman Reese quick release mini-hitch. This has a 40mm square reciever on the vehicle with a removable tow ball mount and a rating 1400kg max trailer. The tow bar is made in sections with separate side arms being inserted into the chassis rails. The cross member spanning the rear panel of the vehicle bolts on to the side arms. The Jetta has a multiplex wiring system which means the tail lights and brake lights share the same wires. VW sell a special loom for this vehicle which like the Golf is sold for big dollars and requires re-coding of the ECU. We use an electronic control model made by Lumen in Australia which allows you to operate the trailer lights while protecting the vehicle electronics from any faults caused by dodgy trailer wiring. 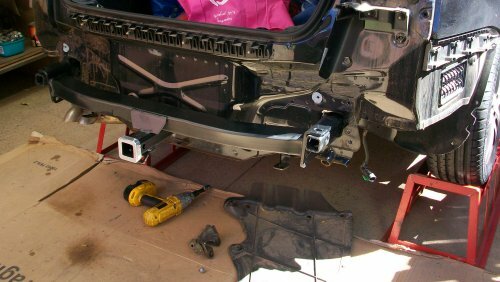 Total fitting time is 3 to 4 hours because of the wiring and you have to make a window thro the bumper skin for the hitch to pass thro. This involves measuring, remeasuring, procrastinating for a bit, remeasuring then cutting.